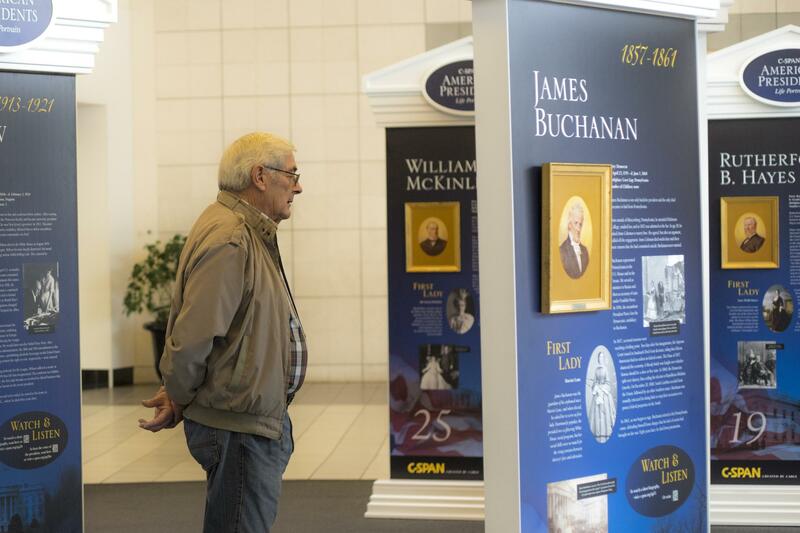 A patron looks at the presidential portraits Tuesday, April 17, 2018, at Eastland Mall in Bloomington. The presidential portraits at Eastland Mall in Bloomington. 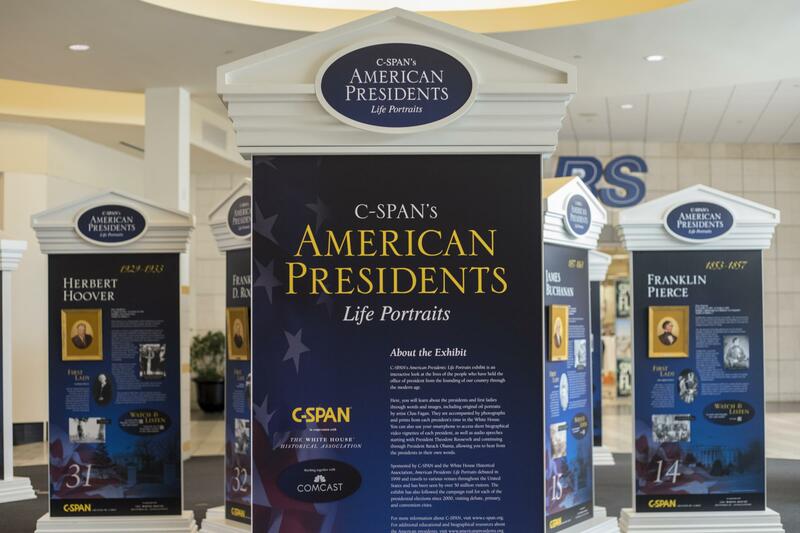 So when the public affairs cable network C-SPAN asked Fagan to paint portraits of all the American presidents for its documentary series on the presidency, he jumped at the invitation. “I grew up in Europe, so inevitably you become more patriotic and proud of your own country’s short history,” the North Carolina-based artist said in a telephone interview on GLT’s Sound Ideas. Fagan’s nine-by-12-inch portraits of the presidents are now traveling the country. 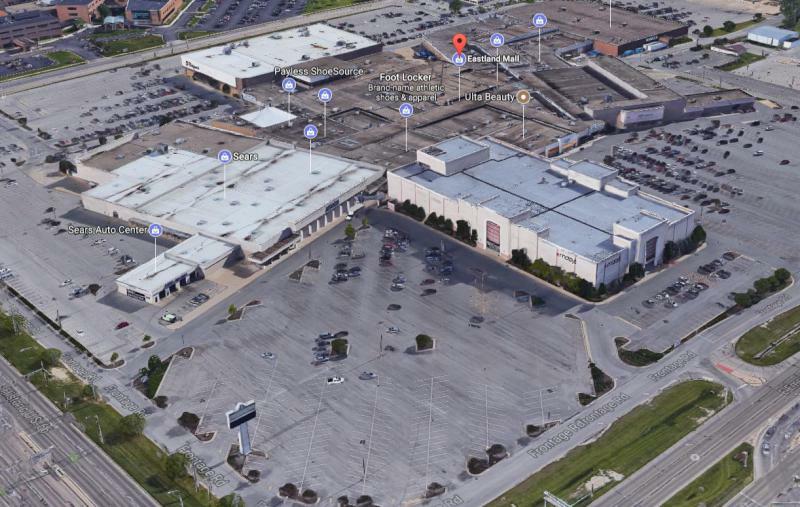 They are on display at Eastland Mall in Bloomington through June 28. The displays are up at Eastland Mall through June. 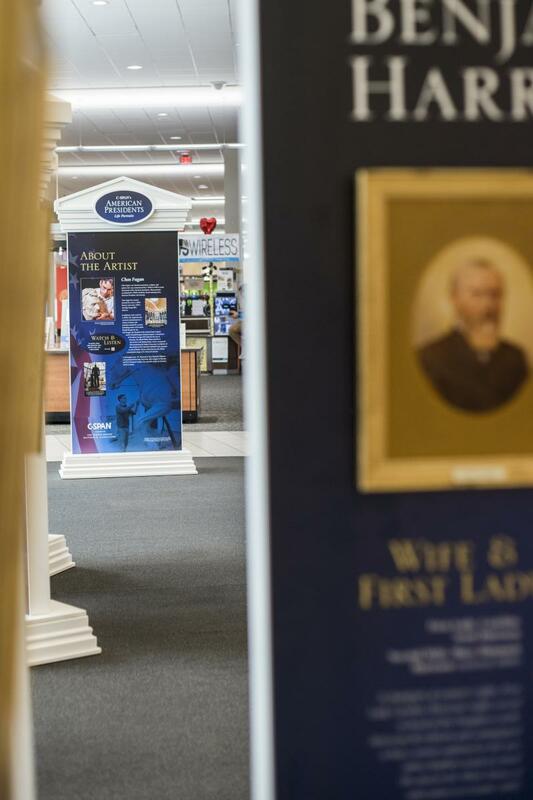 In addition to the portraits, the exhibit includes panels with information about each of the presidencies and the nation's first ladies. Fagan said it was actually easier to paint presidents who served before the invention of photography, for whom only other paintings existed. By contrast, modern photography actually made the job of painting later presidents more difficult. Fagan said he thought it would be “smooth sailing after photography that came in.” But that proved not to be the case. Still, the earliest forms of photographs, known also as daguerreotypes, were helpful to him. “The early photographers were true artists in setting up beautiful lighting and showing the shape of the face, which is key for an artist like me. So older photographs were often beautiful and able to tell me a lot,” Fagan said. But then came the invention of flash photography. “Eventually, the flash became located on the camera, so you’re flashing a light, like flashing a flashlight on the face directly. 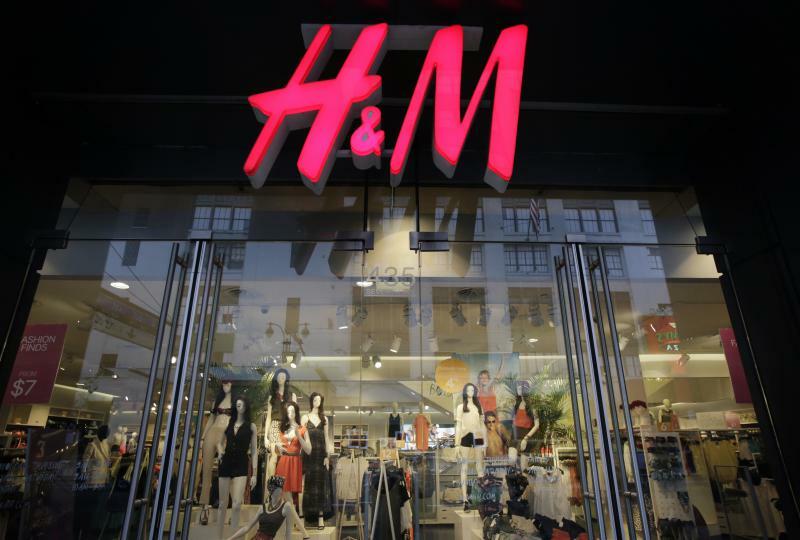 So you’re not really seeing shape of it,” Fagan said. Contemporary photographs taken by official presidential photographers and photojournalists also weren’t helpful. “We got used to candid photos, interrupted moments when the person is speaking, and not the classic pensive moments,” he said. 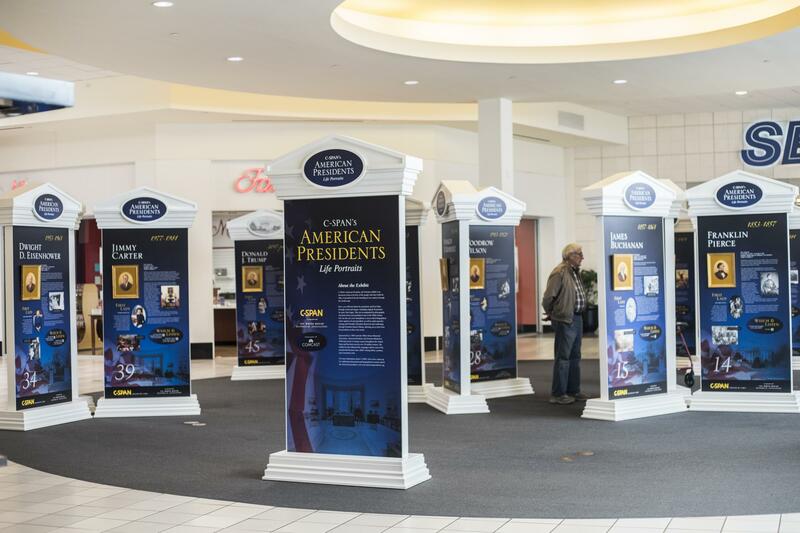 Artist Chas Fagan painted the 45 presidents in an exhibit on display now at Eastland Mall in Bloomington. Fagan said he tried to paint each man in a reflective pose, and not smiling. One exception, though, is President Jimmy Carter. “The idea of a portrait is to have an interpretive face where you can ... bring to it what you wish," Fagan said. "A smile negates that … With a smile you are left with a smiling person and there is no interpretation left." With Carter, “By far the best images were the smiling ones. And remembering that time period well, that was very true, the image portrayed of him was of that constant smile," he explained. Fagan said he felt closer to some presidents than others. One is President William Howard Taft. That’s because C-SPAN had Fagan work on Taft’s portrait on live TV. “As a result, I have a great fondness for Taft now,” Fagan said. President John F. Kennedy was another. “I tried to convey some of his tragic story in my image of him,” Fagan said. Another favorite is William Henry Harrison, who served only one month before dying in office of pneumonia. Harrison’s successor, John Tyler, also proved interesting. In an age before air-brushing, Fagan discovered that a popular engraving of Tyler had radically altered his prominent nose. But daguerreotypes from the era clearly showed Tyler’s “strong, remarkable nose,” Fagan said. “I ended going back to the true history and painting him as he really looked,” Fagan said. 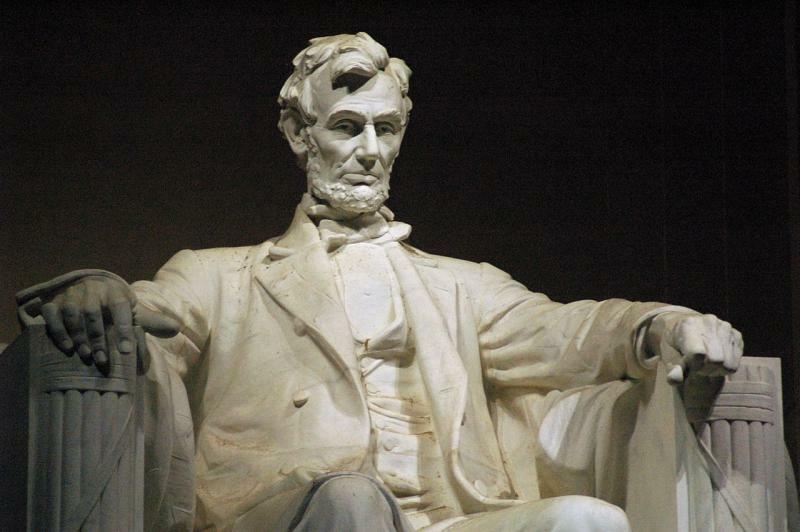 With Abraham Lincoln, Fagan said his research showed the 16th president possessed a quick wit and appreciated humor. He tried to capture the portrait he painted. “The Lincoln I painted for C-SPAN is not the one we think of at the Lincoln Memorial who looks very severe and stern,” Fagan said. “My absolute goal was to try to capture the personality,” of each man, he added. Although there have been 45 presidents, there are only 44 portraits. That’s because Grover Cleveland was twice elected, but in non-consecutive terms. He was both the 22nd and 24th president of the United States. Fagan said another aim of the exhibit is to show the stability of our presidential history. 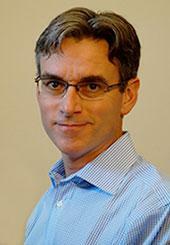 “Even with all of these people and transitions of power, you see the continuity,” Fagan said. He said one other fact stood out for him: there has yet to be a female president. Illinois residents are invited to help choose the 200 greatest people, place and things in state history as part of Illinois' bicentennial celebration.